Filipinos have been known as having a diverse and interesting palate that a lot of different cuisines from around the world have found its way here. It is inevitable because the growth of restaurants opening in various places have peaked this past few years. Greeka Kouzina is one of the very few restaurants that offers Greek cuisine. Not many have been properly introduced (including me) to Greek cuisine, but I was glad for this second chance. 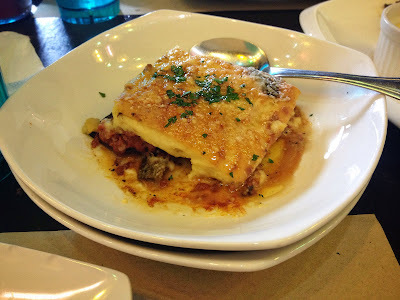 My first encounter with Greek cuisine was a bit overwhelming (refer here). I was explaining to Kaycee (marketing manager and part owner) my first encounter. I was asking her what flavors constitute a normal Greek cuisine just to compare the experience. My inner foodie was again giddy as I browse through their menu. 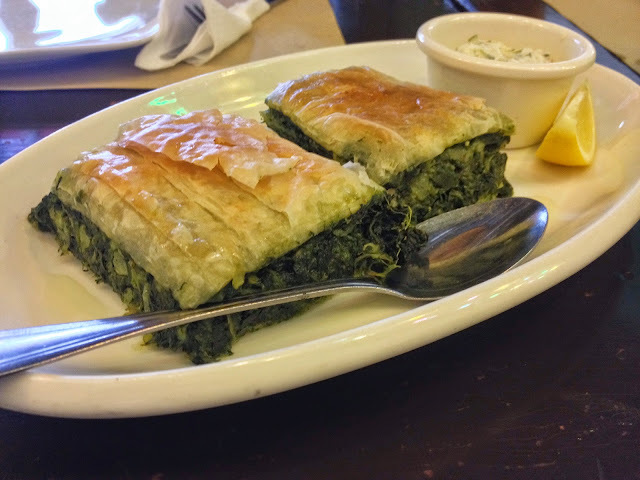 Greek cuisine sure has a lot of nice options for people who prefer to eat healthy. Greeka Kouzina has a lot of options for appetizers and sidings. There is a wide range of dips which goes well with the soft and warm pita. We tried the Melitzanosalata (Eggplant dip) which is grilled eggplant over charcoal and also Hummus, classic Greek chickpea dip flavored with roasted garlic and tahini. Sadly, I wasn't able take photos of it, I guess I got too excited and munched on it right away. Spanakopita is light and made of 98% fat free phyllo pastry baked with spinach, feta and Greek herbs. You can feel the texture of spinach in every bite. 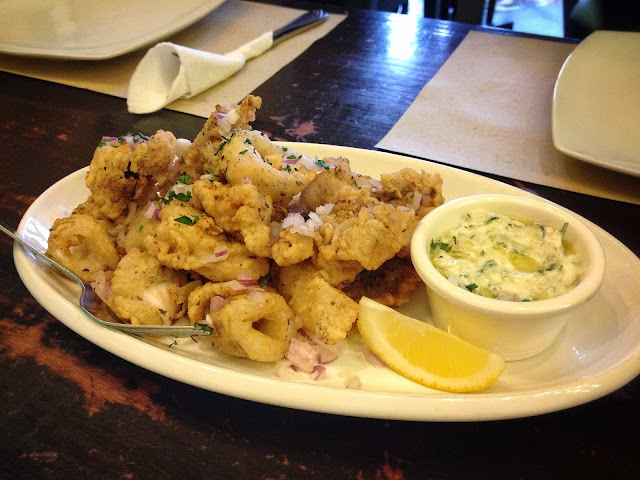 Kalamari Tiganito is fried squid sprinkled with alatopiperigamo, Greek's own version of calamari, but the taste is just the same. 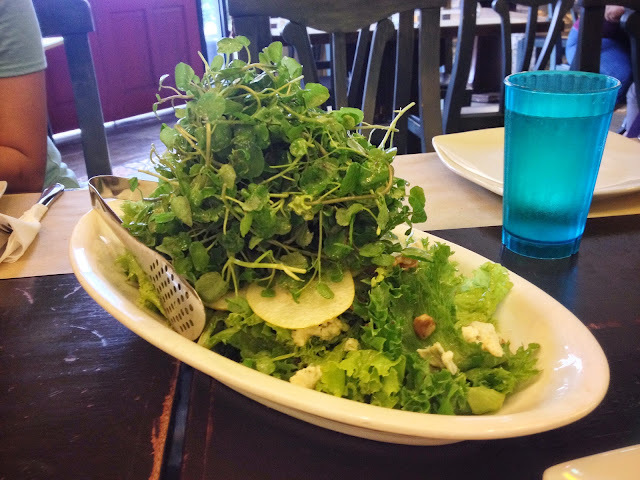 What is interesting in their menu is their selection of salads, and I did not expect that the salad servings would also be big and good for sharing. 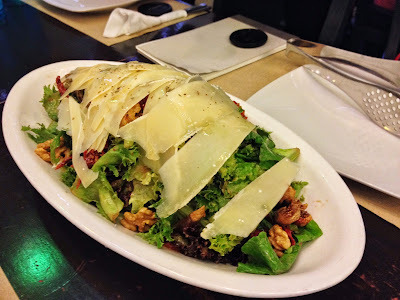 This salad comprises of sweet figs, walnut and sun-dried tomatoes on a bed of arugula and mixed greens topped with provolone cheese. The figs gave a nice texture to the salad. 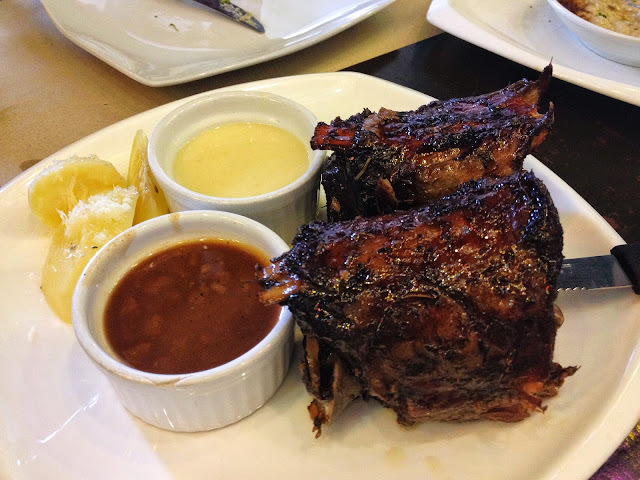 Greeka Kouzina's best dishes would be their roast selection. all is good for sharing and served with roast potatoes and your choice of sidings. 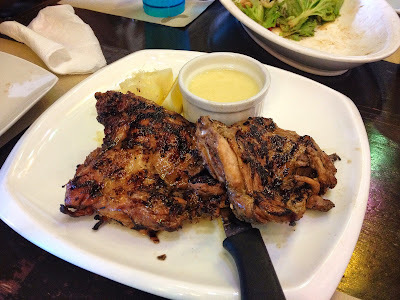 Kotopoulo is grilled chicken which was tender and juicy. I did not have to use the dip for the meat is full of flavor. 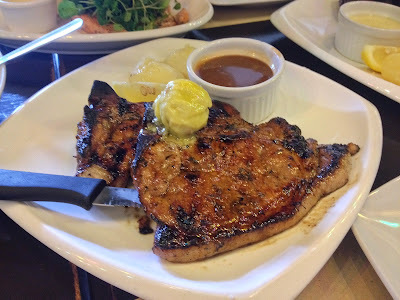 Krastes is grilled pork chop with blue cheese walnut and Greeka's signature gravy. Again, the meat were tender and juicy, and the yellow dollop of something (I forgot what it's called, sorry!) added a different flavor to the meat. I did not touch the gravy as well. Their Lamb shoulder is roasted for 5 hours and seasoned with Greeka's spice blend which gives an added flavor to the lamb. I just had a hard time picking up the tender meat parts as for it was boney, well I guess it should since it is the shoulder part. This is Greeka Kouzina's bestseller. 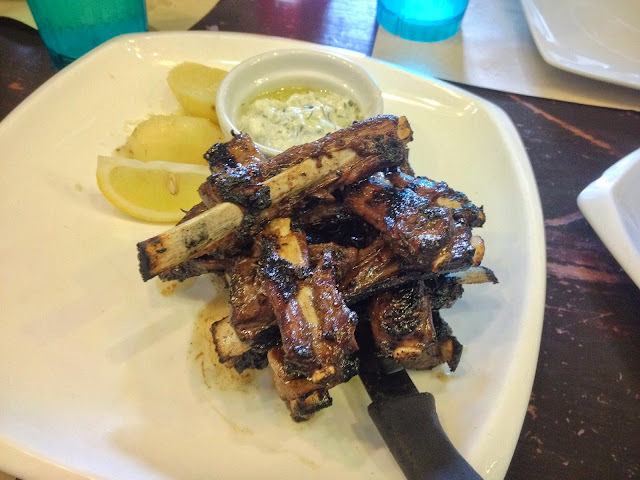 Paidaka is grilled lamb cutlets marinated in Greeka's signature spices. I was longing to much this cutlets like a caveman, but my braces made it hard for me. I couldn't comment on its flavor for I gave up gnawing the bone. 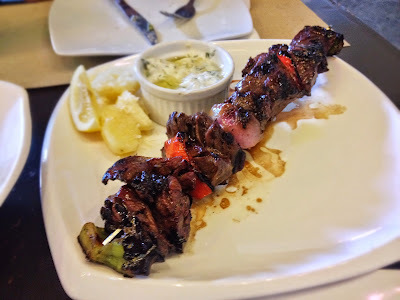 Souvlaki is char-grilled skewers of beef and vegetables that comes with a choice of siding. Souvlaki is my favorite for it was easy to eat and almost a complete meal with the vegetables that goes with the skewer. This is perfect with a cup of rice as a side. 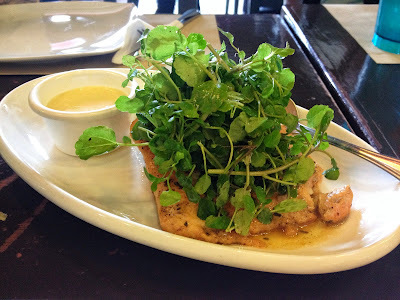 The Salmon was cooked in Greek wine with a side of lemon sauce. The salmon meat was flavorful. The sauce added a citrusy flavor to the salmon. To pair with their roast dishes, you can customize which side dishes you prefer (and they have more than 10 choices aside from our good ol' favorite white rice. It varies from different types of pasta and salads as sides. The siding are good for only one person, if you are sharing the meat dish, you might want to order and extra siding. Moussaka is grilled eggplant layered with beef tomato sauce and cheesy bechamel. This was so good that it can be compared as a vegan lasagna. I wanted to ask for another round of moussaka that time, but I got shy and I worry that I would be too full to try the other dishes. 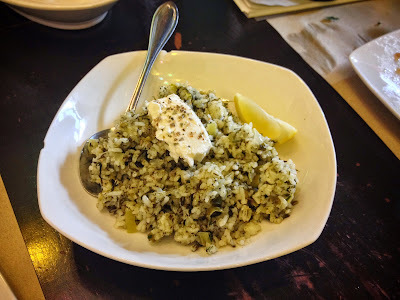 Spanakorizo is rice, spinach, dill, and mint herbs sprinkled with feta cheese. It's like Greek fried rice which had the full flavor of spinach and herbs. 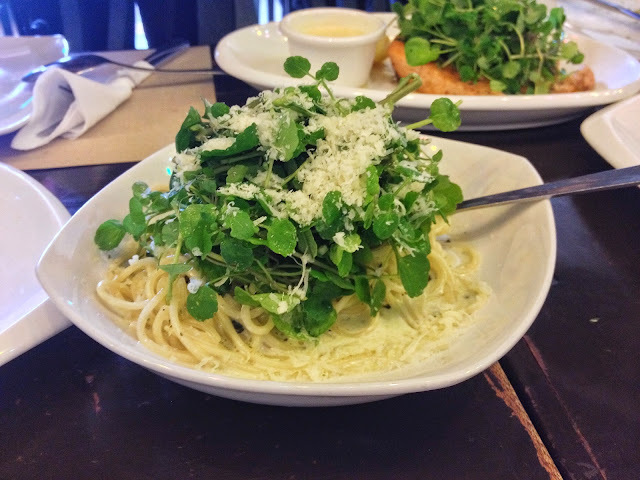 The watercress pasta is a creamy pasta topped with watercress and tomatoes. 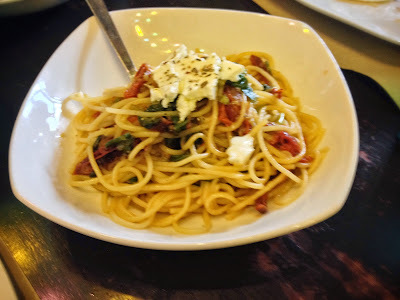 This pasta was so creamy like a carbonara dish, the only difference would be the watercress toppings. 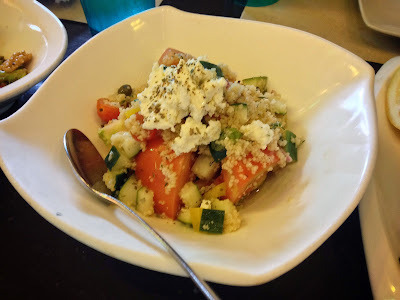 Greek Couscous Salad is made of couscous served with greek summer vegetables. It was more of vegetables than couscous but relatively tasty none the less. It's pasta and spinach with tomatoes cooked in garlic olive oil and white wine topped with feta cheese. This pasta was so fresh and so good. I was savoring the flavor so I could recreate the flavors in my kitchen, that's how good it is. Of course, desserts are a must. 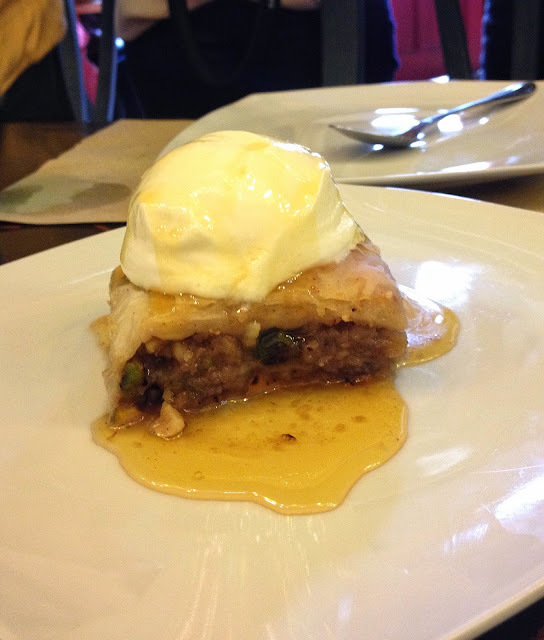 I was excited to try the typical Greek dessert, Baklava. My first Bakhlava was too sweet and crunchy for my taste. The pastry was drowned in syrup. But Greeka Kouzina's version was way different. It had ample sweetness, contrasted by the Greek yogurt topping which added a tangy taste. The phyllo pastry was soft, nesting the candied walnuts. It was a perfect redemption for me. 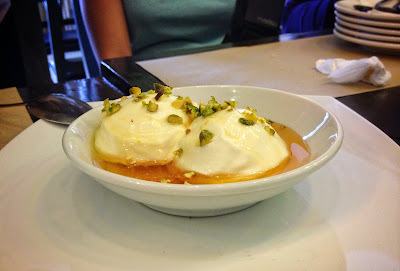 We were also served Greek Yogurt in honey topped with pistachio nuts. I cannot distinguish how Greek Yogurt differs with typical yogurt, but the way Greeka Kouzina presented it, like a soft-served ice cream topped with nuts and honey, this sure is a winner dessert choice. The overall dining experience was good. I enjoyed munching on their gargantuan salads and sidings. If I wanted a healthier option when eating out, Greeka Kouzina would surely be on my list of restaurants. Greeka Kouzina have two branches, first is in Greenhills (the one we visited) and their newest one in SM Aura. They are also planning to expand and open two more branches this year, one in Quezon City this 2nd quarter and another one in the latter part of the year. That's real good buzz people, there's no more excuse to eat yummy and healthy dishes. Do you like Greek Cuisine also? Let us know which dishes are your favorite in the comments below! Special props to Aldous for inviting us to this foodie gathering.